The masterpieces from Heinrich Dinkelacker, handmade in Budapest, promise luxury for your feet. Heinrich Dinkelacker is one of Germany's oldest and most exclusive men's shoe brands. For almost 140 years, the name has stood for tradition, craftsmanship and exceptional appearance. Entirely in the spirit of slow fashion – without running assembly lines or the haste required by piecework pressures – the Budapest-based manufacturer only produces around 25 pairs of shoes each day. Which is no surprise when you consider the 300 individual work steps a shoe has to go through before it is finished: a large number of them still carried out by hand today, as they were then. The same applies to the choice of materials: only the best of the best. An exclusivity that a true shoe lover can see and feel thanks to the extraordinary wearing comfort. WHAT MAKES A HEINRICH DINKELACKER UNIQUE? The shoes from Heinrich Dinkelacker are not only distinguished by their outstanding quality and the associated longevity. Thanks to our passion for unique detailing, any true shoe lover will immediately recognize a Dinkelacker. The braided welt is the hallmark of Hungarian craftsmanship. This decorative element is formed during the hand-stitching process, when the cobbler weaves two strips of leather between the welt and double seams Dinkelacker is the last remaining brand to use this meticulous Budapester stitching technique. Models with a triple sole feature a large brass toe tap. This is the only kind of outsole thick enough to support this carefully hand-screwed detail. This toe tap has a charming look and also prevents the outsole from wearing down too quickly. Depending on the sole construction, a pair of Dinkelacker shoes can feature up to 168 brass nails in the outsoles and heels. The nails are driven in one by one by hand, in sets of either three or six. They reinforce the parts of the leather sole that are most likely to suffer wear and tear, keeping them in mint condition. Whether a shoe fits or not depends largely on the last on which it was crafted. Feet are as unique and varied as the people who walk around on them. At Heinrich Dinkelacker, every foot will find its perfect fit. This shoe with its characteristic braided welt has been manufactured in Budapest for more than 50 years and enjoys unbroken popularity. 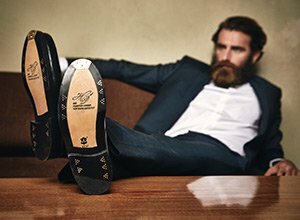 The double sole with its hand-painted Rendenbach leather is further reinforced by brass pins that extend around the entire sole. The most classic last shape produced by Dinkelacker. For over 60 years it has formed the basis for the classic Budapest shoe with its triple sole. A shoe that makes a statement for handcrafted perfection and timeless taste. This last with its slightly tapered tip offers an alternative to all lovers of Heinrich Dinkelacker who are looking for a slim and elegant shoe. In contrast to the Milano, the Luzern also offers more space in the forefoot area. The Milano is characterized by its slender basic shape. The flat forefoot area serves the needs of wearers with a lower instep The double Rendenbach leather sole is another feature that isn't to be missed here either. The Wien is the classic loafer last at Dinkelacker. In particular, a distinction is made in the fit between a short shoe strap for a high instep and a longer strap suitable for a flatter foot. The Janosh K is often the savior for all men with a particularly sturdy foot. The K width is only rarely used and cannot be found anywhere with the same range as offered by Heinrich Dinkelacker. Whether it be shoes, boots or even loafers, every model is available on the Janosh. This last never seems clumsy, but instead has a balanced and unobtrusive appearance.